Did you know? It only takes a few minutes to create an online booking engine. You can start accepting reservations for your rental properties online instantly. 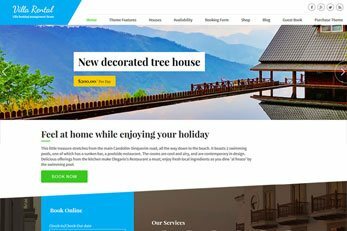 So without waiting anymore, create a website with this Villa rental WordPress theme and get started now. The theme comes with the easy install feature. So, just one click, you can install the sample data and make your site look like our demo. This loads your website with default settings, sample content. 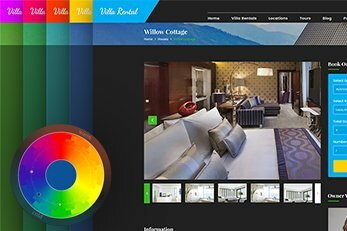 You’ll just need to input your content, image galleries, set villa or room prices and start accepting online bookings instantly. 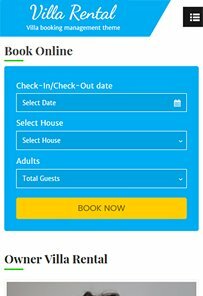 The ready to use booking engine lets you manage the booking and even accept the payments online. 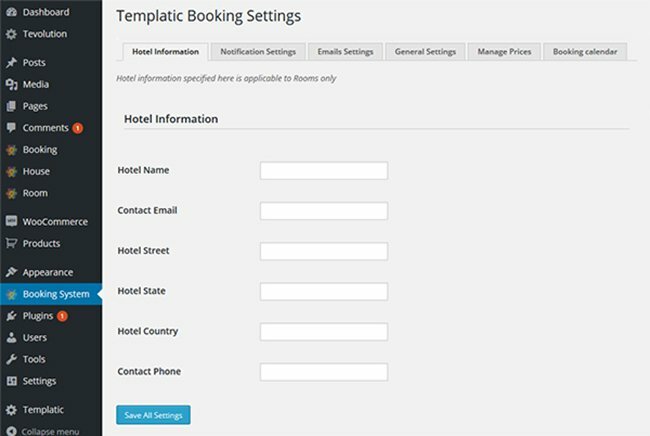 You can use this advanced booking theme to manage single or multiple properties. The theme is powered by our Tevolution and Booking plugins which are both included. This WordPress Property rental script lets you create profession property rentals systems. Without hiring programmers or designers. This theme is best for you if you own a property that you wish to rent out lettings or if you are a realtor or real estate agency. 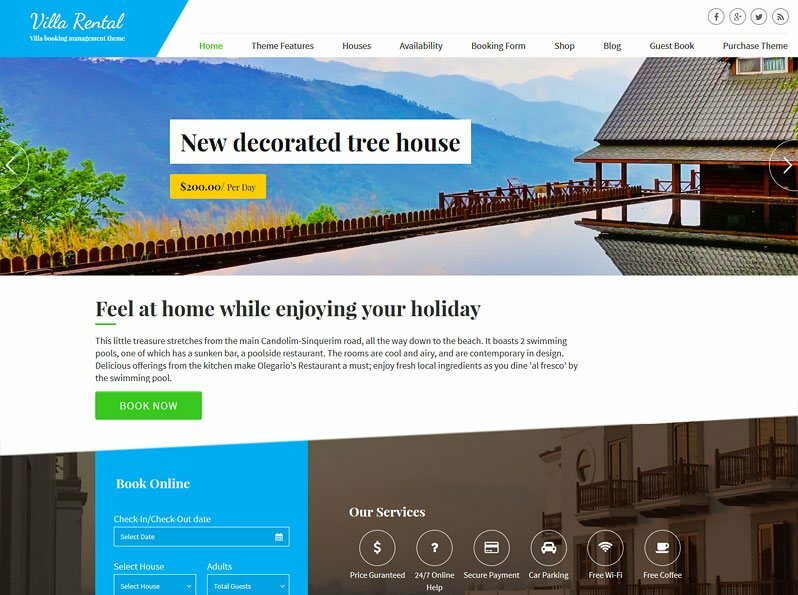 Alternately, you can use this theme for hotels, villas, holiday homes, etc. 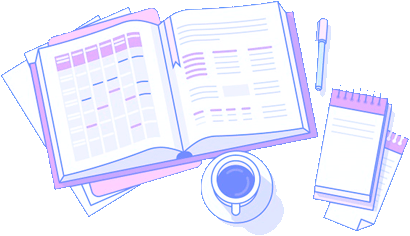 You can use this booking system to manage bookings for one or thousands of rental properties, each gets its own prices and booking calendar. 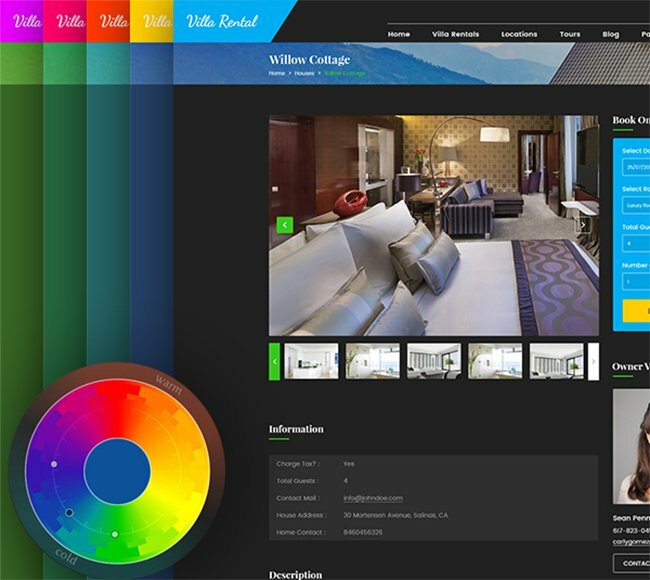 Change the look and feel of your website very easily with the theme’s customizer. Uploading your logo, changing the colors or footer credit can be done in seconds from the dashboard. Creating your new custom fields or property categories is easy too. You can have just 1 if you like but categories are great for organizing your site if you have more than one rental property. Rental Tariff PageYou don’t need to manually create a property rates/tariff page. 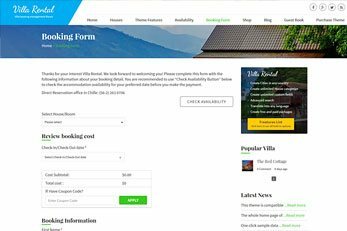 The theme automatically generates this page for you with all the prices of rooms or villas. Block Reservation DatesManaging property rentals is made easier if you can block certain dates so a property cannot be rented. This theme lets you do just that. 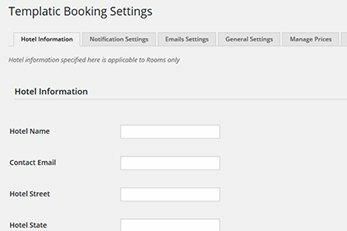 Manage Email TemplatesEdit the email messages which get sent by the theme on certain booking or user actions. The text for these is available to edit in the dashboard. 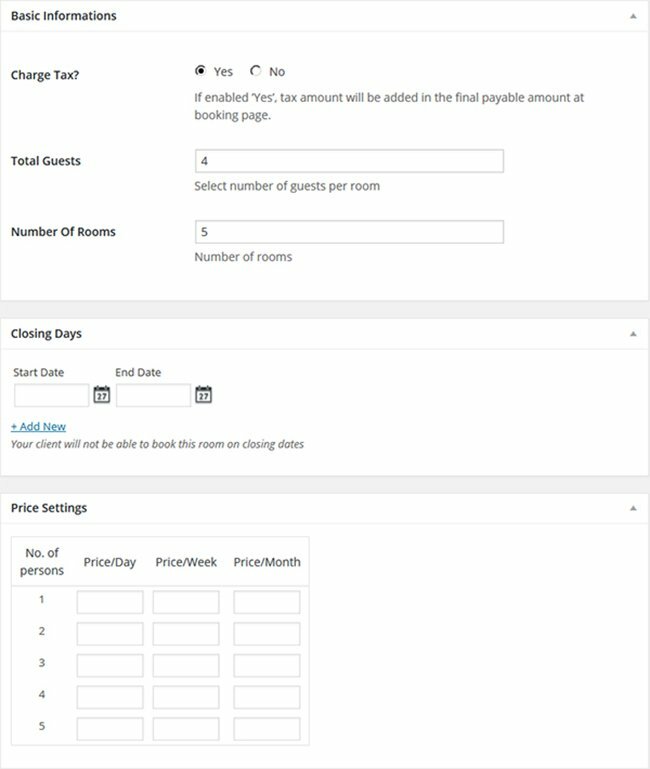 Charge TaxThis theme also lets you charge a tax on property booking. The tax is applied and charged during the booking process. Deposit OptionThe system comes with a deposit feature which you can activate from the dashboard. Activate this with a press of a button. Change BackgroundCustomize the look of your website by changing the background. This can be done from the easy to use customizer. Image SliderThe theme includes a stylish homepage image slider. This is a great way to showcase a property on your website. Endless ColorsThe theme comes with an easy to use color customizer. This lets you quickly change the default color scheme. Social Share ButtonsYour website visitors can share properties or content on Twitter, Facebook, and Google+ social networks. Theme allows you to place sliders into full-width sections, adding beauty to the entire screen. 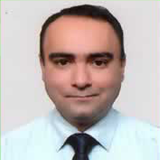 Each slide can have unique text on it which can be changed from the backend. This powerful booking theme is only complete if you can accept online payments for the reservations. Theme comes with the PayPal payment gateway so all you’ll need to do is enter your PayPal address and you’re set to go. The theme also comes with a Pre-bank transfer payment method in case you need that too. 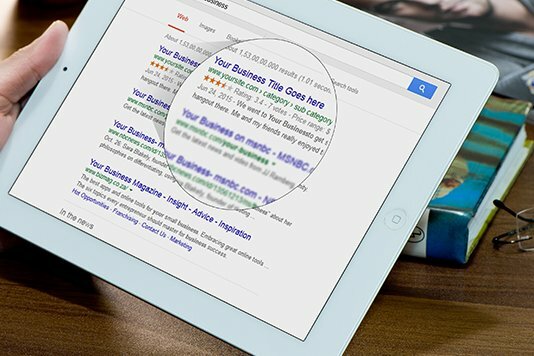 At Templatic we understand the importance of SEO for any website. 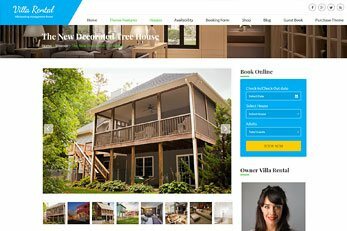 Including Villa Rental, all of our WordPress themes are optimized for search engines. 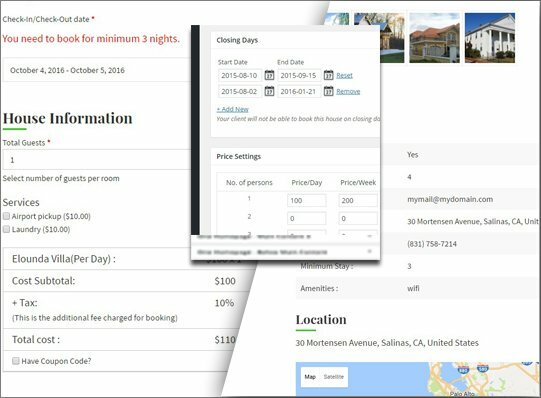 Control the number of booking days for each of your houses. Along with that, you can set a separate the lowest number of days value for each created seasonal price. 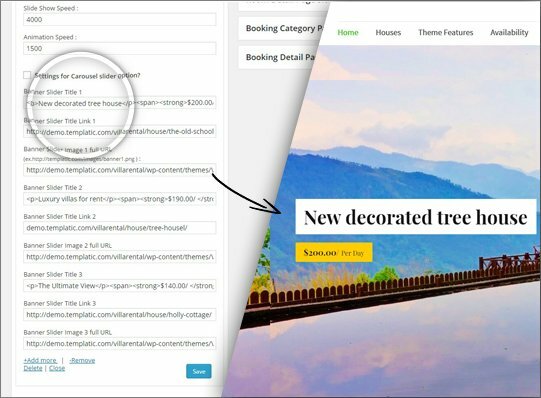 Templatic designs and builds last-generation property booking themes with multi-device technology. Our themes are built for higher conversion rates, modern, usable, and capable of generating a great user experience. This theme integrates all the advantages of a responsive design and adaptive design. This theme adapts to all devices screen size (PC, smartphones & tablets). Always displays your website’s important information on mobile devices. 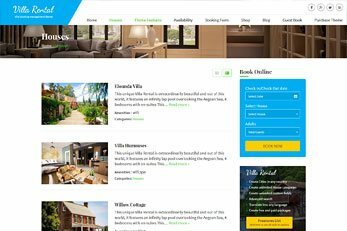 As well as all the powerful back-end options, this villas or property booking theme is designed with care to help you create a stylish website. An inviting looking website is sure to boost your online bookings. 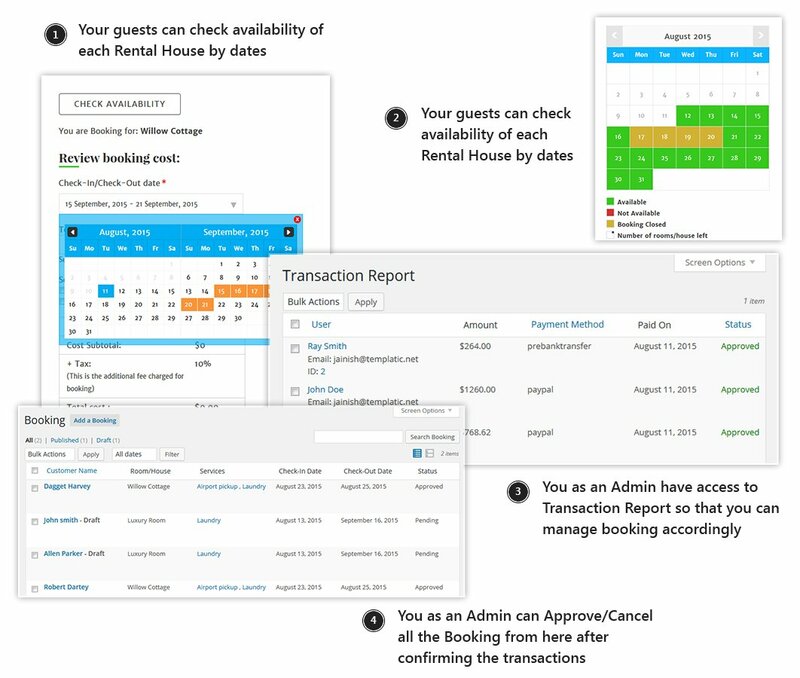 No need to use any other booking online software, property management systems, scripts or booking engines. Such systems generally charge commissions. This theme comes ready to go with all the booking functions you’ll ever need. You can easily change the look of the theme’s homepage. You can place new widgets or re-arranging the existing ones. You’ll be able to customize the look of your properties’ website’s homepage and other widget locations. Want to use this theme for different properties like: apartments, studio apartments, houses or even bed and breakfasts? You can add new fields to the form to match different properties. The reservation form on the theme can also display optional extra services. 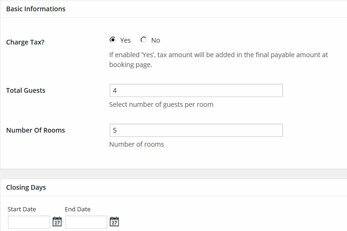 These can be easily created via the dashboard and your guests are charged during the booking process. Install the WPML plugin for multilingual property rental websites. Guests making an online booking can easily switch between languages you have provided. This theme is designed to work for different types of property lettings. Need to have rates for high season or low season? You can do exactly that by simply entering the dates and prices. Depending on the selected date, the prices will differ. 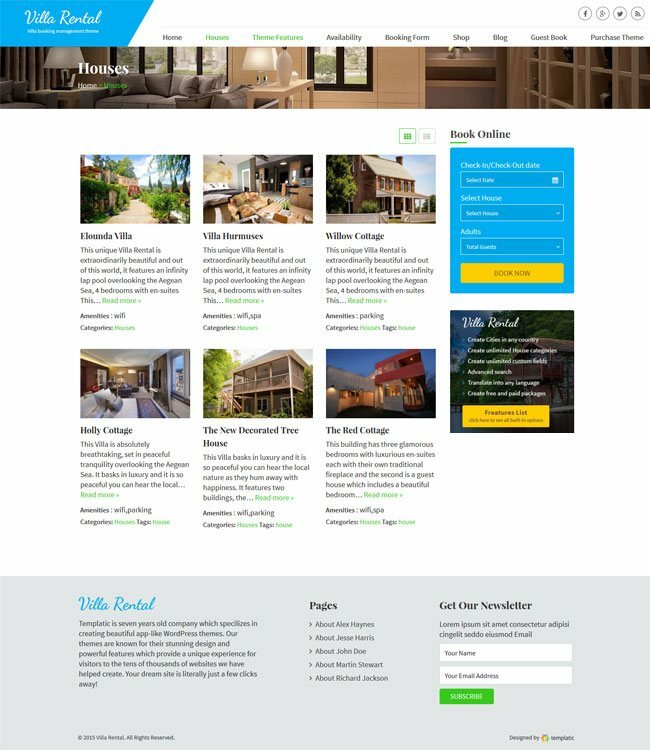 This is your all-in-one solution if you’re looking for a powerful property booking theme. 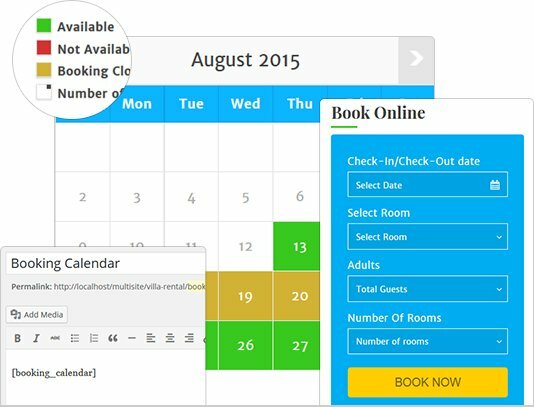 An availability calendar comes with the booking system, no external booking engines necessary. A really good way to encourage more reservations is to offer discounts. This powerful property management theme also comes with coupons. You can create exact amount or percentage coupons from the dashboard. 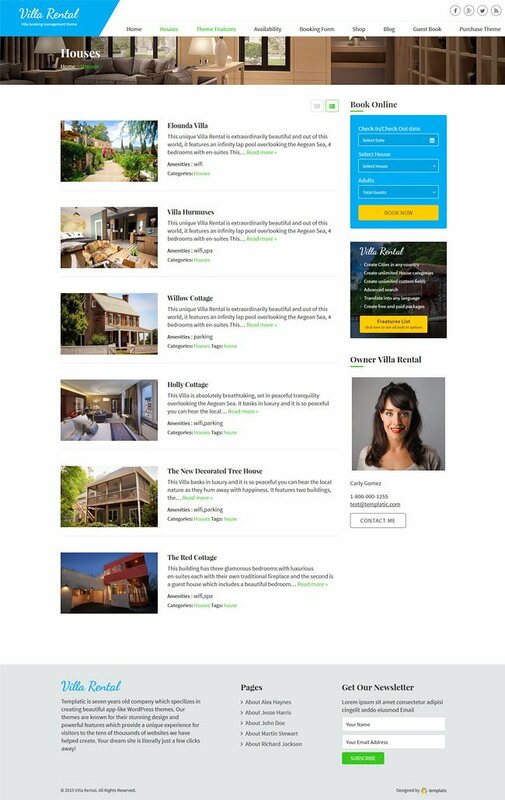 So now that you have your own booking system, you need a blog to promote those properties right? We’ve thought of that too. This theme comes with its powerful built-in blog. Create your own categories and start blogging. 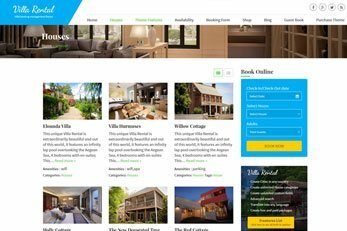 The Villa Rental theme has been tested the WPML plugin. This is a great plugin if you wish to launch your property rentals website in multi languages. The theme is also translatable with the .PO and .MO files which come with it. The WPML plugin is not required if you just wish to translate it to another language instead of English. 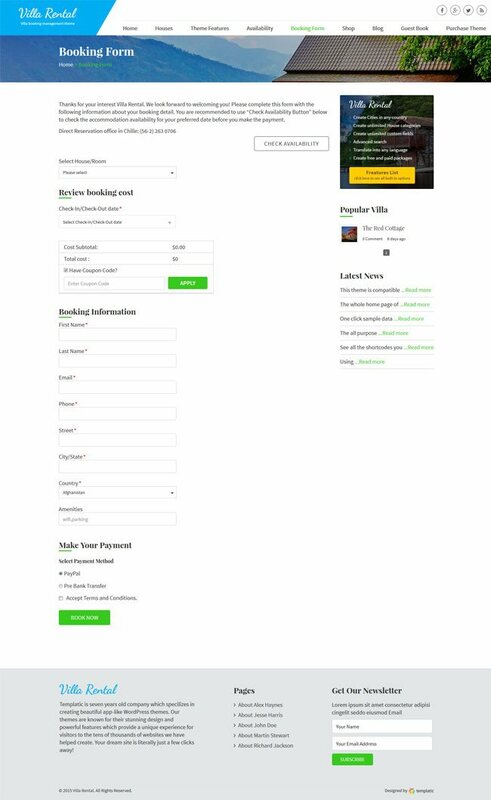 This booking theme wouldn’t be all that powerful if you weren’t able to accept online payments. The PayPal payment gateway is of course included so you can use this theme for renting properties straight away. 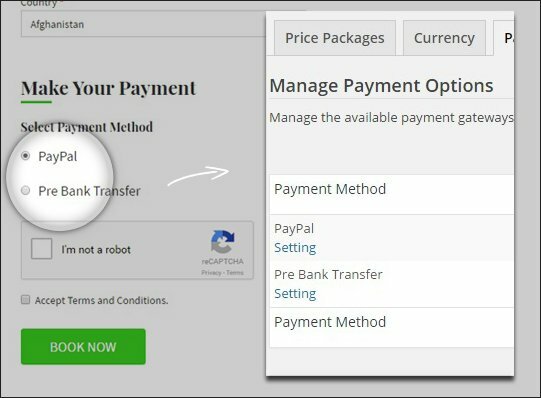 Moreover, you can choose from 15+ premium payment gateway add-ons which are all compatible with this rental theme to accept payment against bookings. Booking accommodation online has never been easier for guests. 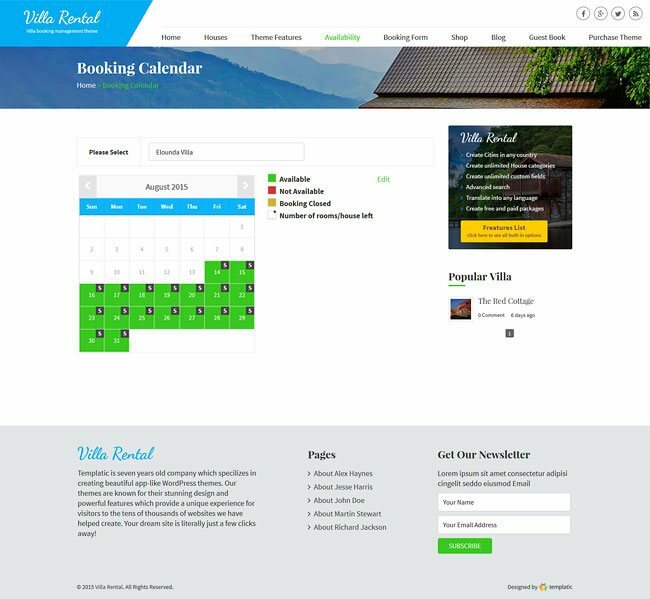 This theme comes with user-friendly booking form and an availability calendar. Managing property bookings is just as easy too. As admin you have full control over the theme’s reservation system. 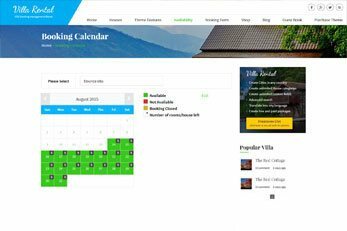 As well as our other WordPress booking themes and following its success, our Booking system now also powers the Villa Rental theme.